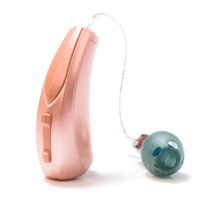 Hearing aid companies release new products all the time, but truly groundbreaking innovations like Starkey Livio AI come only once in a while. Livio AI blurs the boundaries between hearing aids, wearable health technology, and multifunction consumer audio devices known as hearables. Starkey calls the new Livio AI the world's first Healthable—a multi-purpose device that redefines what a hearing aid can do. This is the first hearing aid to feature integrated sensors and artificial intelligence for tracking brain and body health. The Livio AI concept is based on scientifically-sound evidence that healthy hearing contributes to overall brain and body health. These hearing aids don't just help you hear better. They aim to help you live better. Starkey's goal is to make it easy for you to take a proactive approach to your health and wellness. Thanks to three-dimensional motion sensors integrated into the hearing aids, Livio AI can detect movement, enabling them to function as an activity tracker. They can count your steps, recognize gestures that control the hearing aids, and even detect if the wearer falls. Combined with the Starkey Thrive Hearing Control app, you track brain and body wellness scores and set goals to improve your activity. The Thrive app scores derives your scores from your physical activity throughout the day, how long you wear your hearing aids each day, and how much time you spend actively engaged in conversation. Built on the all-new Thrive platform, Livio AI provide better sound quality than any other Starkey hearing aid. "Hearing Reality" technology, introduced now for the first time, provides 50 percent better user satisfaction in noisy listening situations, according to Starkey. Hearing Reality delivers upgrades in clarity, comfort, and hearing performance from the quietest to the noisiest environments. It's designed to separate different "layers of sound", amplifying sounds that contribute to better understanding in conversation, while preserving peace and quiet for a natural listening experience. With the Thrive Hearing Control app, you can easily adjust Livio hearing aids from compatible Apple iOS or Android mobile devices. Use the app to adjust the hearing aid volume, personalize your settings, and more. Add geotags to automatically activate your preferred listening program based on your location. The app uses your smartphone's GPS to detect when you arrive, and automatically switches to the designated program. Hear phone calls, TV and more directly through your Livio hearing aids using the Thrive app or one of Starkey's easy-to-use accessories. Thanks to new technology in Livio, you can enjoy consistent wireless performance while streaming calls, TV, music or other media from your smartphone or wireless accessories. Made-for-iPhone connectivity means you can stream audio and phone calls from compatible Apple iOS mobile devices directly to your Livio hearing aids. Streaming from an Android mobile device is possible with the Starkey Hearing Technologies Remote Microphone +.